Today, I have various projects to share with you and I may as well get into it straight away! My first project goes back to Easter, and I used some of the latest Easter stamps by Sweet 'n Sassy Stamps. The set I used is entitled 'Easter Blessings'. I stamped it with Memento Tuxedo Black and coloured the image using Copic Markers. The background is sponged with Tim Holtz distress inks in 'Tumbled Glass' and 'Peeled Paint'. The following two creations were made with the 'Wild About You' stamp set by GinaK Designs. This stamp set is one of my all time favourites and I can't use it enough! I copied Theresa Momber's background technique, sponging the sun and the other colours using various Memento inks. Lastly, I stamped the tree and the giraffe images in Memento Tuxedo Black. The burlap twine is from my stash and the button and trinket accompany the BoBunny 'Zoology' collection. I printed a BTB colouring sheet onto Xpressit Copic Blending Card and coloured Bob and Pilchard using Copic markers. I sponged the background using a cloud die cut and some distress ink. After fussy-cutting them, I mounted Bob using an Action Wobble and added googly eyes to both images. I cut the tree (leaves part) and the grass with cloud and grass dies by My Favourite Things.The tree trunk is paper-pieced and stamped with the 'Home Is' stamp set by GinaK Designs (illustrated by Tami Mayberry). I also added glossy accents to Bob's hat, belt buckle and tools. Lastly, I'd like to show you my entry for this week's Mix it up Monday Challenge over on StampTV. 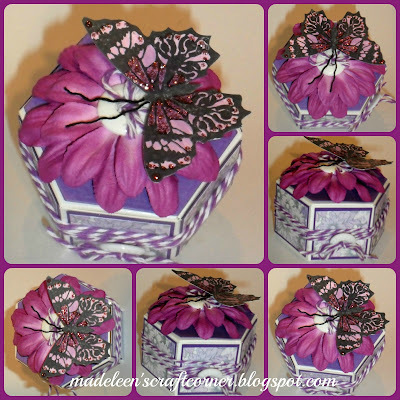 My friend Lee is our host this week, and she challenged us to either create or re-make a box project and add something with wings. I've had these little hexie boxes sitting in my craft cupboard for a while now and they are ideal!! For this project, however, I forgot to add the 'wings' element :( but its cute anyway! 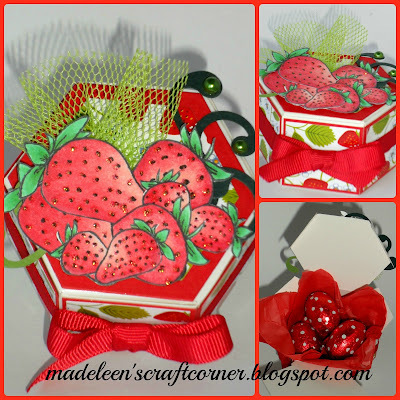 I used the 'Sweet Strawberries' stamp set by GinaK Designs and combined it with Gina's 'Berries and Vines' DP. I stamped the strawberries using Memento Tuxedo Black ink and coloured them with Copic markers. The red card is 'Red Hot' also by GinaK. I cut the hexie shapes for the lid using a set of hexagon dies by the Sweet Stamp Shop. For the sides I measured and cut the paper and card with my paper cutter. The swirls were punched with my wave flourish punch and the ribbon, pearls and tulle are from my stash. I also added Stickles in 'Fruit Punch'. Thanks so much for popping in and leaving some love! Na 3 weke van net naaldwerk en breiwerk en geen kaartjies nie, is ek terug by my rekenaar om als te bewonder wat ek gemis het!! Jou projekte is almal pragtig; ek's mal oor die boksies en die BTB kaartjie is sooooo perfek vir 'n oulike laatietjie! Baie groete en lekker 'craft'. Uber cool box and love all of your cards! You have been busy!! Hello, Madeleen. Popping in to say "hello" and see you have been busy! Such awesome cards and projects.